Currently I am working on a brand identity. I have to decide which color to use but I can't understand how the systems work. I read previous posts here and also searched the internet but still I have questions. Find a Pantone color and set this as my color, and believe that RGB and CMYK will appear the same. Keep the RGB I like and find a CMYK and a Pantone I like and set these to colors (it doesn't matter that they are not listed as analogous if the eyes see them as analogous). Choose a Pantone, then an RGB and CMYK depending how the eye sees it and not depending on the numbers. Keep the RGB and change it into CMYK no matter how it looks. In short: what are the steps for choosing a color (company uses both printed and digital material)? In reality, it's up to you. Do whatever works and looks best, no matter what that is—don't blindly rely on numbers or automatic conversions. Generally what you want is to find colors that match as closely as possible. Pantone colors are specifically designed for faithfully reproducing single colors, so choosing a Pantone color and sticking to that is a good way to go. Pantone itself gives conversions to CMYK and RGB of its colors that you can use, they're normally pretty spot on but there's nothing stopping you from coming up with your own values. 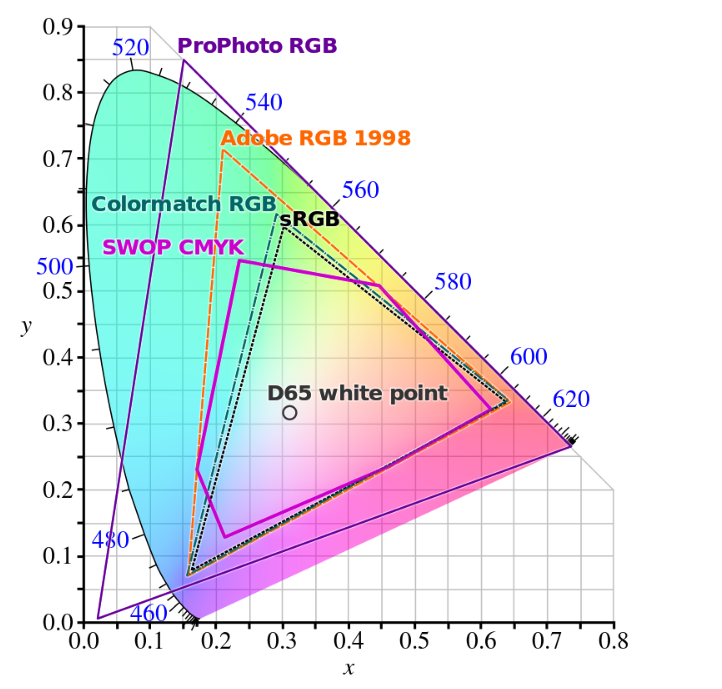 Keep in mind that RGB has a bigger gamut than CMYK* so there are colors you simply cannot reproduce going from RGB to CMYK (as you have seen). Pantone similarly has many colors that you simply cannot achieve in CMYK. There is nothing stopping you from using those colors and choosing as similar a CMYK color as you can, but be aware that there will be noticeable differences depending on the medium, which obviously isn't ideal. Or you can pick colors that are comfortably within the gamut of RGB, CMYK and Pantone and have consistent colors, but you are then limiting your choices (the easiest way to do that is to start with CMYK). As with many things, it comes down to compromise. At one extreme you have the perfect color that you unfortunately cannot faithfully reproduce, and at the other extreme you have consistent colors that are dull are boring. Hopefully there is a happy medium. But, as I said before—it's all up to you (Not only is it up to you but it is specifically your job to make that decision. Just make sure you can back up that decision with solid reasoning). CMYK can produce less colors than RGB, which is why many "equivalent" colors can seem dull or washed out. Pantone can produce brighter colors since they use specially-mixed inks, however it is often more expensive to use spot (Pantone) colors for printed materials. In an ideal world you'd have a color that works well in all 3 systems, but that is not always possible. So what to do? Of the options you have, I'd discard 1 and 4, as you won't get good results when printing. What I'd do is find a CMYK color you like (because CMYK is the hardest to get right), find the RGB/Pantone equivalents, going by eye (with a well calibrated monitor and pantone swatches). Great answers above, but I want to also call out that the first step in color selection is to start with the company's target audience. Color psychology, etc. You may have already done this, but I'm adding it because I didn't see it mentioned. Not the answer you're looking for? Browse other questions tagged color cmyk branding rgb color-reproduction or ask your own question. digital artwork design working in RGB or CMYK (or pantone) for printing? How to convert colors from PMS to RGB?